It’s summertime here and very pleasant, lazing on a sunny afternoon over a quiet little lunch. Just me and Mr T and a whole lot of berries. With three kilo picked this morning, and more to go, the berry plague can be quite demanding. We began with six raspberry plants three years ago, and now have two large patches, producing around 500 grams a day, along with two kilo of boysenberries/youngberries a day and a few strawberries. Bird netting, along with some good rain, has made all the difference in the world. Today’s summery recipe is based on my recipe from one year ago. 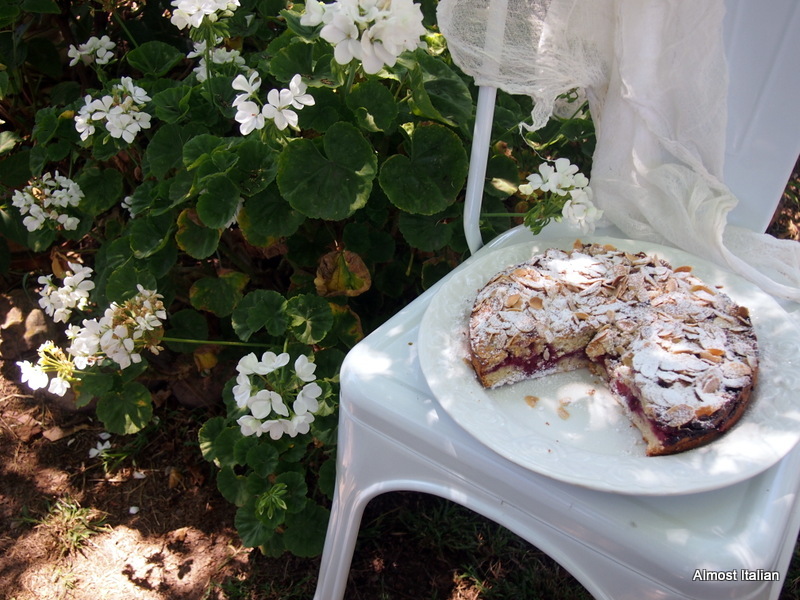 My Apricot Almond Cake with Amaretto, Easy Frangipane is the most popular recipe on my blog. I don’t know why- perhaps because it’s so easy. I hope you enjoy this version. It’s festive but light. It would easily convert to a gluten free version too. Preheat oven to 180c. Grease a 25 cm loose bottom tin. Line base and sides with paper. Stir in the flour mixed with the baking powder, then fold in the almond meal, followed by the brandy. 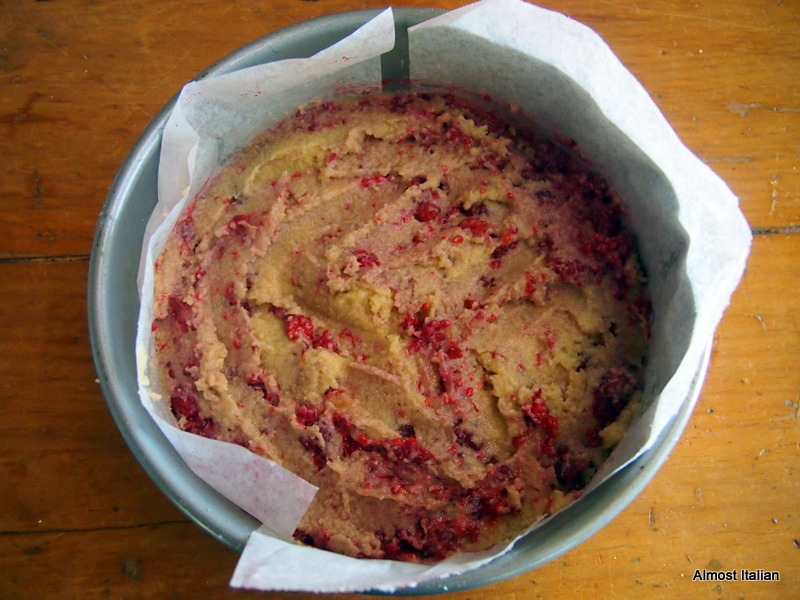 Place half the batter in the prepared tin, cover with the raspberries, then add the remaining batter, using a knife to smooth the top. Scatter the top with the flaked almonds. Bake for 50 minutes. Check with a knife or skewer to check if cooked through. Often this needs a further ten minutes especially with juicy berries. Dust with icing sugar, serve with runny cream. Today’s song plant. Sunny Afternoon. The kinks. I think you may have just given me the Christmas dessert for this year! Looks heavenly and I’m sure it will work well as gluten free. Wow, I’m excited. Gorgeous photo of the dappled light on the cake, too. Thank you Francesca… if only I could buy some berries from you!! If only I could send a truckload! That is so delicious looking and the photos are super summery and gorgeous. Love the look of this cake and would be great ‘de-glutenised’ as well. Back into the berries after that wee beach holiday, noice work. Yes, but berry back breaking too! Ooo, the marito would like this! Do you think it would work with blueberries? The most Italian version is with pears and amaretto but the pears are dodgy at present. Any fruit that will sit down in the mixture and bleed a bit of flavour should work. Tuo Marito e` un uomo fortunato! Oh Francesca .. That looks divine! I shall make it .. Suspect I might eat it all too! Why don’t you live closer? I’d invite myself over for tea and cake 🙂 I have berry envy as well ..
You could have tea, cake, wine and a few kilos of berries. Shame about the big Bass straight between our abodes. When I picked berries in NZ all I wanted to do was take them home and bake with them like this! Oh Francesca that look so so good. 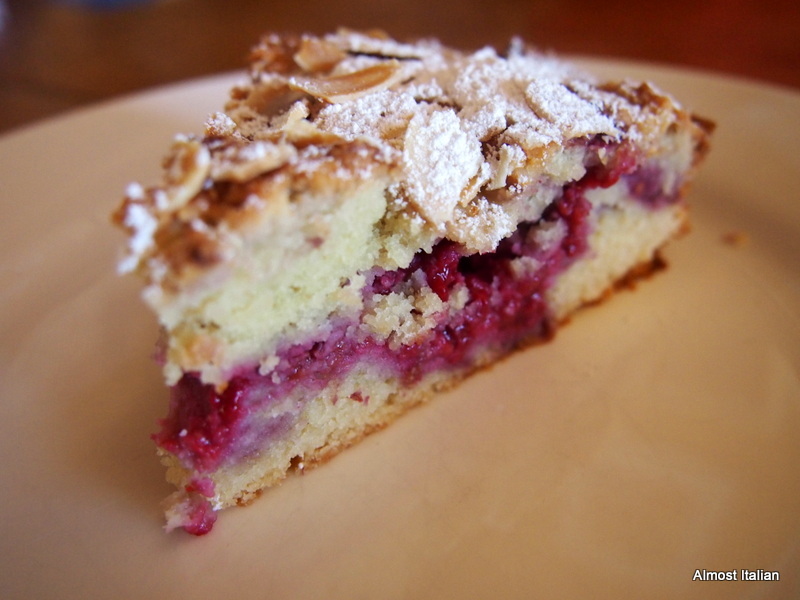 I adore frangipane, but it never occured to me to give the pastry the flick, I’ll be making this very soon! You could ditch the plain flour and substitute with gluten free flour I am sure. No pastry means it is fast to make and much lighter to eat. Maybe you should come here and pick berries! It is never far from my mind either. Mr T Berry came and did a wonderful ukulele version solo recently. Great lyrics, great key changes. I love to live so pleasantly. Now the cake. Yes it does keep very well. Warning though: unless you just won tattslotto, raspberries are hideously expensive to buy. I grow them, hence the Kinks song and reference to life of luxury. The apricot version is also delicious. Keep it in the fridge then bring it back to room temp. I made it but my batter was not quite as wet as yours looks in the photo. We’ll eat it on Saturday and see!! The batter is a stiff batter despite what the photo may look like. 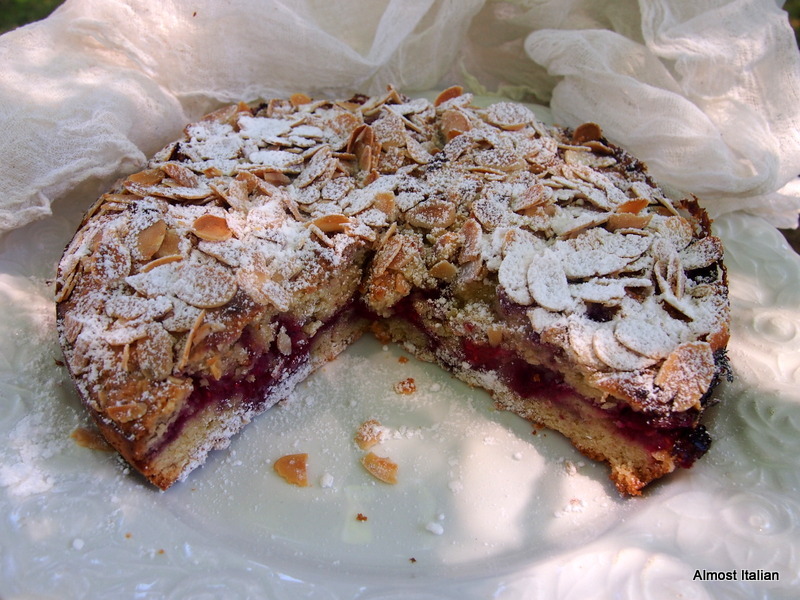 It is meant to be quite stiff as it is a dense almond frangipane cake. The fruit filling is uncooked- this provides further moisture as the fruit gives off some moisture in the cake. My first attempt went down quite well despite cooking the apricots. Thanks so much for this recipe Francesca. People asked me to send the recipe to them. Of course I will, crediting you. Try it in winter with pears and amaretto. The best. That looks delicious, the photos are beautiful. I love berries & wish I had berry patches, I’m envious! Thanks. The berry plague is berry welcome. Out again for another pick. I love frangipane cake and this does look reasonably easy. Definitely bookmarking this recipe! Its an old stand by- great in winter with pears. Yes, good idea. It lasts if you put it in the fridge. The apricot verson is also good, and cheaper, the pear one is good in winter but I am yet to try it with peaches and nectarines. I think blood plums would be good too. This looks delicious, I think I will try it with the gluten free flour. Thank you. Liz, let us know how the cake goes with the gluten free flour. Oh, lovely! 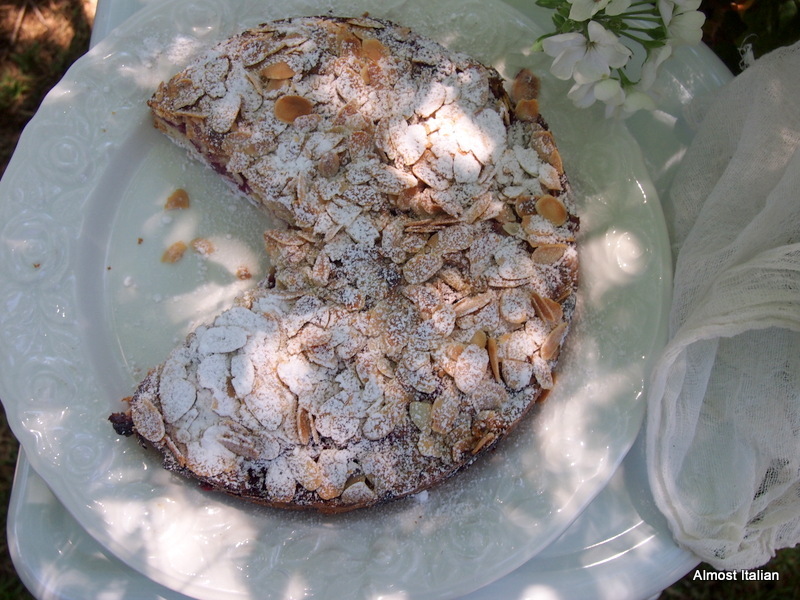 I still have some raspberries in the freezer, so this goes on the list of things to make – especially since I loved your apricot almond cake. Set beautifully amid the white geraniums! Thanks Moya.Must try it with apples in winter. I think it would be fabulous with blackberries. I hope it goes well. Thankyou kindly and have a wonderful New Year.